We decide whether an experience is “good” or “bad,” and the meaning we assign to our experience creates and reinforces our identity, beliefs, capabilities, and behavior. Resilient teams have three key ingredients: safety, belonging, and mattering. To shift your state and create choice, we’ll find your starting point. Resistance reinforces the Present State, which is where the problem is. Learn how to release resistance so you can have more choice. To live in a state of emotional agility more consistently, we need to build certain mental muscles of self-awareness. We do so by increasing emotional rapport with oneself and stilling the constant chatter of our mind. Shakespeare was right: nothing is good or bad but thinking makes it so. Learn how to choose your response to what happens to you, and the story you want to tell about it. Now that you have choice, what exactly would you like? Once you figure out what you want, you can help others do the same. A clear Desired State combined with potent sensory anchors can make all the difference. Forge your emotional agility strategy with others; enroll, align, and engage even the most challenging types to help you create the needed change. Help your team build trust and keep the change going, and increase emotional agility in yourself and others. 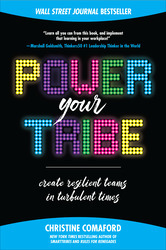 Help your tribe navigate any obstacle, thrive on feedback, and redefine their personal best.